Abstract: Traditional methods treat track points (lines) equally to extract road data, which ignores the spatial distribution disparity and restricts its application. Therefore, this paper proposes a new approach for map construction based on trajectory segmentation and layer fusion from vehicle tracks. First, track line subset is selected through the segmentation filtering method based on speed profile. Second, three road map layers are constructed by the Delaunay triangulation through adding different constraints according to the feature of track line subset. 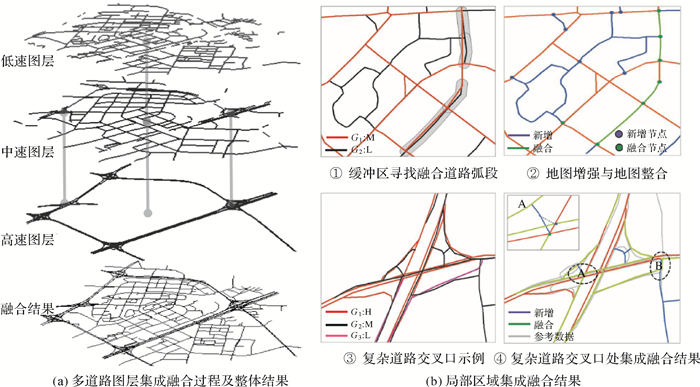 Third, buffer method is used to integrate multiple road layers into a single road map. 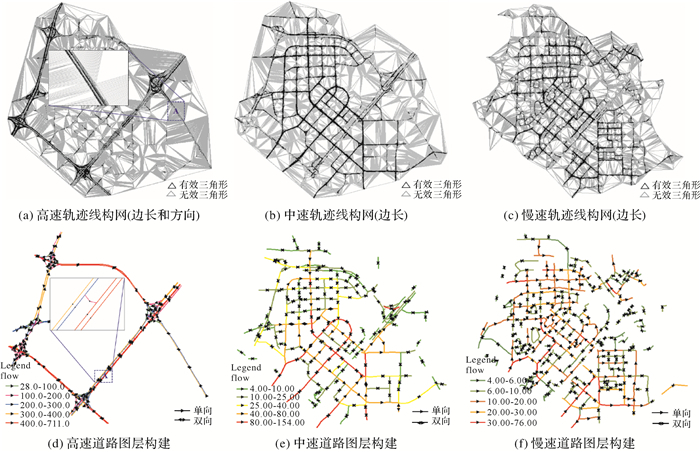 An experiment using taxi GPS traces in Beijing is verified the novel method. The experimental results show that our method can extract road geometry and traffic semantic data considering the heterogeneity of trajectory, and the accuracy of result is improved compared with the two existing methods. WANG Jing, WANG Chaoliang, SONG Xianfeng, et al. Automatic Intersection and Traffic Rule Detection by Mining Motor-vehicle GPS Trajectories[J]. Computers, Environment and Urban Systems, 2017(64): 19–29. LI Jun, QIN Qiming, XIE Chao, et al. Integrated Use of Spatial and Semantic Relationships for Extracting Road Networks from Floating Car Data[J]. International Journal of Applied Earth Observation and Geoinformation, 2012(19): 238–247. 杨伟, 艾廷华. 运用约束Delaunay三角网从众源轨迹线提取道路边界[J]. 测绘学报, 2017, 46(2): 237–245. KARAGIORGOU S, PFOSER D. On Vehicle Tracking Data-based Road Network Generation[C]//Proceedings of the 20th International Conference on Advances in Geographic Information Systems. Redondo Beach, California: ACM, 2012: 89-98. LIU Xuemei, BIAGIONI J, ERIKSSON J, et al. Mining Large-scale, Sparse GPS Traces for Map Inference: Comparison of Approaches[C]//Proceedings of the 18th ACM SIGKDD International Conference on Knowledge Discovery and Data Mining. Beijing, China: ACM, 2012: 669-677. CAO Lili, KRUMM J. From GPS Traces to a Routable Road Map[C]//Proceedings of the 17th ACM SIGSPATIAL International Conference on Advances in Geographic Information Systems. Seattle, Washington: ACM, 2009: 3-12. 唐炉亮, 刘章, 杨雪, 等. 符合认知规律的时空轨迹融合与路网生成方法[J]. 测绘学报, 2015, 44(11): 1271–1276. 杨伟, 艾廷华. 基于众源轨迹数据的道路中心线提取[J]. 地理与地理信息科学, 2016, 32(3): 1–7. WANG Suyi, WANG Yusu, LI Yanjie. Efficient Map Reconstruction and Augmentation via Topological Methods[C]//Proceedings of the 23rd SIGSPATIAL International Conference on Advances in Geographic Information Systems. Seattle, Washington: ACM, 2015: 25. BIAGIONI J, ERIKSSON J. Map Inference in the Face of Noise and Disparity[C]//Proceedings of the 20th International Conference on Advances in Geographic Information Systems. Redondo Beach, California: ACM, 2012: 79-88. LIU Xuemei, ZHU Yanmin, WANG Yin, et al. Road Recognition Using Coarse-grained Vehicular Traces[J]. Beijing:HP Labs, 2012. 中华人民共和国住房和城乡建设部. CJJ 37-2012城市道路工程设计规范(2016年版)[S].北京: 中国建筑工业出版社, 2012. Ministry of Housing and Urban-rural Development of the People's Republic of China. 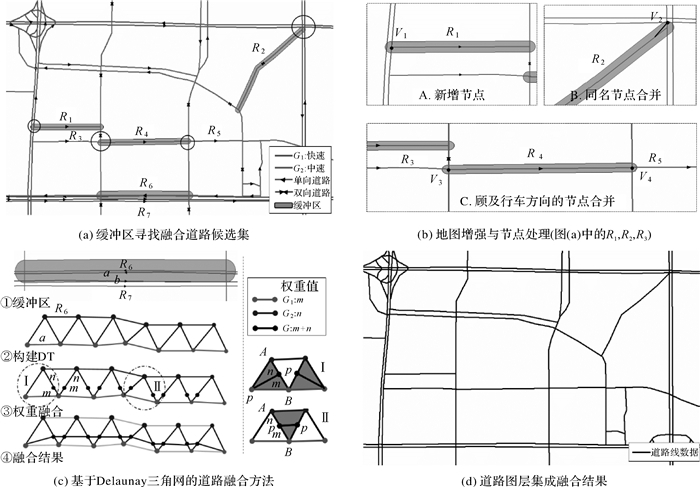 Code for Design of Urban Road Engineering[S]. Beijing: China Architecture and Building Press, 2012. KARAGIORGOU S, PFOSER D, SKOUTAS D. Segmentation-based Road Network Construction[C]//Proceedings of the 21st ACM SIGSPATIAL International Conference on Advances in Geographic Information Systems. Orlando, Florida: ACM, 2013: 460-463. PALMA A T, BOGORNY V, KUIJPERS B, et al. A Clustering-based Approach for Discovering Interesting Places in Trajectories[C]//Proceedings of the 2008 ACM Symposium on Applied Computing. Fortaleza, Ceara, Brazil: ACM, 2008: 863-868. JONES C B, BUNDY G L, WARE M J. Map Generalization with a Triangulated Data Structure[J]. Cartography and Geographic Information Systems, 1995, 22(4): 317–331. LIU Qiliang, TANG Jianbo, DENG Min, et al. An Iterative Detection and Removal Method for Detecting Spatial Clusters of Different Densities[J]. Transactions in GIS, 2015, 19(1): 82–106. ZHENG Yu, LI Quannan, CHEN Yukun, et al. Understanding Mobility Based on GPS Data[C]//Proceedings of the 10th International Conference on Ubiquitous Computing. New York: ACM, 2008: 312-321. LYU Haiyang, SHENG Yehua, GUO Ningning, et al. 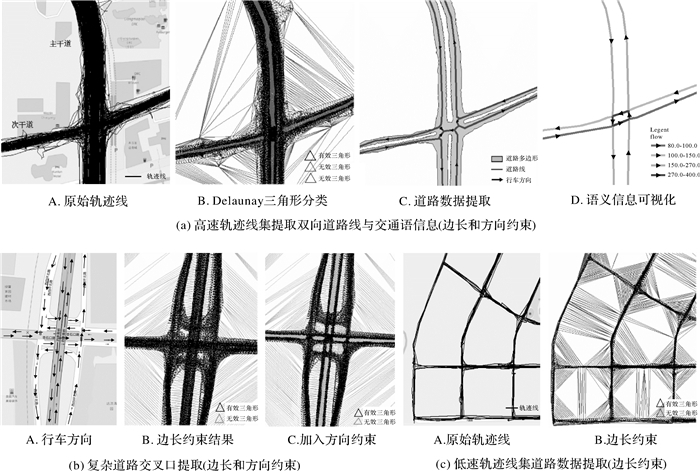 Geometric Quality Assessment of Trajectory-generated VGI Road Networks Based on the Symmetric Arc Similarity[J]. Transactions in GIS, 2017, 21(5): 984–1009.